Background: The most successful long-term treatment of morbid obesity is surgical intervention. Many options exist, but the most popular is the Roux-en-Y gastric bypass (RYGB). The laparoscpic procedure is associated with a low complication rate and a short hospital stay. 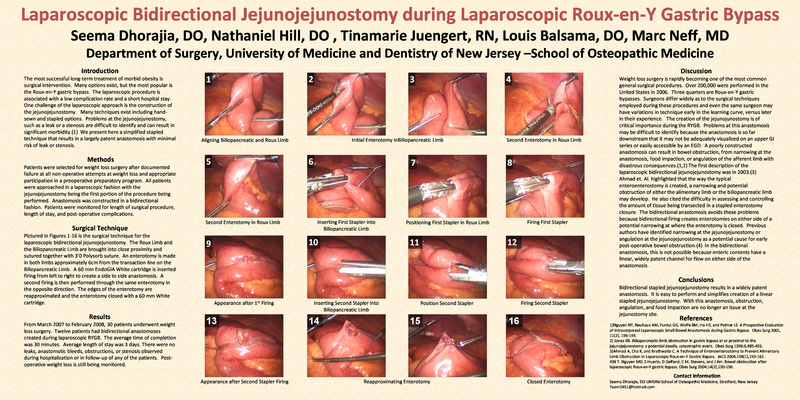 One challenge of the laparoscopic approach is the construction of the jejunojejunostomy. Many techniques exist including hand-sewn and stapled options. Problems at the jejunojejunostomy are difficult to identify, specifically a stenosis. We present here a simplified stapled technique that results in a largely patent anastomosis. Methods: Patients were appropriately selected for laparoscopic gastric bypass surgery. Anastomosis were constructed in a bidirectional fashion. First an enterotomy was created in the Roux limb and the biliopancreatic limb. Then an 60mm Endo GIA cartridge was position with a blade in either limb and a side to side anastomosis was created. Then a second Endo GIA was inserted through the same enterotomy and fired in the opposite direction. The enterotomy was then closed with an Endo GIA and the ends of the jejunojejunostomy buttressed with vicryl sutures. Results: From March to August of 2007, five patients had bidirectional anastomoses created. The average time of completion was 45 minutes. There were no leaks, obstructions, or stenosis observed during hospitalization or in follow-up of any of the patients. Post-operative weight loss is still being monitored. Conclusion: Creation of a widely patent jejunojejunostomy during laparoscopic RYGB is a critical portion of the procedure. Stenosis can result in significant post-operative abdominal symptoms and can be hard to diagnose. The bidirectional anastomosis is simple to construct and obviates the need for worry about this portion of the procedure. We currently perform all of our jejunojejunostomies during laparoscopic RYGB by this technique.